After writing the book, Neusner sent it to Joseph Cardinal Ratzinger to ask if he would consider praising it for a cover blurb. The cardinal readily agreed, to Neusner’s great delight. And, no doubt to Neusner’s even greater delight, Ratzinger—who had become Pope Benedict XVI—returned to the book again in 2007, devoting a good twenty pages of his bestselling book Jesus of Nazareth to discussing Neusner’s work. Neusner is certainly correct that we cannot relativize or ignore the deep differences dividing Jews and Christians, and in this respect his instincts and intentions are admirable. The careful reader of A Rabbi Talks with Jesus, and Benedict’s response, will realize, however, that, even as Neusner attempts to delineate the differences between Judaism and Christianity, his book dilutes the deepest of those differences. The dialogue between Neusner and Benedict, rather than serving as an example of all that can be achieved by Jewish-Christian debate, is instead a reminder of the pitfalls in the endeavor. In Jesus of Nazareth, Benedict describes how, with A Rabbi Talks with Jesus, Neusner “takes his place among the crowds of Jesus’ disciples,” listening to the Sermon on the Mount. Neusner, Benedict continues, “speaks with Jesus himself. He is touched by the greatness and purity of what is said, and yet at the same time he is troubled by the ultimate incompatibility that he finds at the heart of the Sermon on the Mount.” Ultimately, Neusner rejects Jesus’ message, deciding that Jesus deviates from Judaism’s focus on sanctifying this world by turning his followers’ focus from Jewish law and ritual to himself. Essentially, Neusner argues, Jesus equates God’s will with his own, something that someone loyal to the Torah cannot accept. Neusner imagines himself conversing with a disciple of Jesus: “Is it really so that your master, the son of man, is lord of the Sabbath? Then—so I asked before, so I ask again—is your master God?” Again and again, Neusner returns to this question. Both Jesus and the rabbinic sages, he argues, agree that the essence of life is imitation of God. Jews believe that the holy life is achieved via observance of the Torah, the sanctification of the mundane world by adhering to its many minutiae. For Jesus’ followers, their master is now the equivalent of God, of the Torah, and Jesus’ instructions focus less on whether grain can be picked on the Sabbath and more on entering the Kingdom of Heaven. As such, the holy life must be defined by following him. And that, of course, is exactly how Jews must judge it to be today. Jews know that Deuteronomy warns us to beware a prophet who will attempt to lead us astray from all that Moses instructed. Jews have, moreover, known in our history many false messiahs, endowed with extraordinary charisma who announced that they were our savior with authority to abrogate the Torah. And, above all, we remember the Almighty’s admonition: “Take ye therefore good heed unto yourselves; for ye saw no manner of form on the day that the Lord spake unto you in Horeb out of the midst of the fire.” Jews believe that the Torah tells us that the Incarnation is incompatible with all that God has taught us about who he is. Christians embrace the concept of the Incarnation; but, from the Jewish perspective, a human God is the equivalent of a four-sided triangle. The hard truth is that when it comes to the choice facing Christians and Jews, there is no way of splitting the difference: Is Jesus who he claims to be, is he someone worthy of worship, or is he someone with whom even friendship is not worthwhile? Christians answer this question differently than Jews, but Neusner refuses to make this choice. We are now able to understand why Christians should be so genuinely pleased with A Rabbi Talks with Jesus. Neusner, an esteemed academic and observant Jew, has indicated that Jesus is a man for whom he can have an abiding affection, one whom he can intellectually respect. In fact, Neusner writes that he and Jesus are “friends”; he tells Jesus “I honor you and wish you well.” And, as the pope notes, Neusner, “an attentive listener” to Jesus’ words, is “constantly moved by the greatness of Jesus.” But Neusner also admits that Jesus claims to be God. And, if Jesus claims such a thing, then, as C.S. Lewis taught us, he can only be a liar, a lunatic, or God. Surely Neusner would not have respect for a liar; surely he could not befriend a lunatic. Even as Neusner argues that Jesus is mistaken about his divinity and authority, it follows from much that Neusner has written that Jesus must be God. I do not begrudge Benedict his happiness. How could he not rejoice in the significance of a prominent Jew approaching Jesus in such an admiring manner? How could this gifted and sophisticated theologian not see the significance of Neusner’s words? How could Benedict not make Neusner’s book—in which a rabbi recognizes that Jesus puts himself in God’s place and still retains his admiration for Jesus—a centerpiece of his own book on Jesus? But, for Jews, Neusner approaches Jesus in the wrong way, for Jesus is not someone with whom we can have this sort of “dialogue.” If we deny his divinity, then we can respond with nothing short of shock and dismay when we read the words of a man who puts himself in the place of God. Thus, in his admirable attempt to distinguish between Judaism and Christianity, Neusner elides the most important difference of all. Neusner notes that, unlike certain other Jewish scholars who have come before him, he refuses to see Jesus as a rabbi, a colleague of the fathers of rabbinic Judaism. “Christianity,” he notes, “does not believe in a Galilean miracle worker, nor does Christianity worship a rabbi.” As such, Neusner writes in his preface, to honor Jesus with such an appellation is “demeaning and dishonest.” He is absolutely correct. But to find a “friend” in Jesus even as Jesus claims divinity, to deny his claim to be God but at the same time to “wish [him] well,” to reject the assertions Jesus makes while at the same time praising his “virtue” and “wisdom,” is demeaning to both Judaism and Christianity, because it still obfuscates the choice with which Lewis confronts us. What, then, should be the foundation of Jewish-Christian engagement? Neusner finds it unthinkable that Jews and Christians should have nothing to say to each other. “There is more to Judaism in its meeting with Christianity,” he argues, “than a mere no.” He is right, and he is also correct that Jews, living “in the free climate of American religion,” should engage their fellow citizens in this “mostly Christian country.” But the most fruitful dialogue should not, contra Neusner, focus on the nuts and bolts of our relation to Jesus but rather on what traditional Jews and Christians have in common. Benedict’s words ought to resonate with the religious Jew. For even as Jews and Christians profoundly disagree about the truth, they are united in the belief that there is a truth to be sought. Moreover, Orthodox Jews and Christians share a belief in a traditional ethics that is seen today as old-fashioned and outmoded. There is much about the Church today and its leadership that I find troubling. In its attitude toward world affairs, in its statements about Israel and Palestinians, and on the war in Iraq, the Vatican often expresses an overly pacifistic European perspective. But, in an age that Benedict correctly describes as one of “relativism and creeping secularism,” one in which Orthodox Jews are often derided as fundamentalists because of their views regarding religious truth, sexuality, and medical ethics, a Jew who reads Ratzinger’s homily cannot help feeling that he has an ally in Pope Benedict XVI. Does truth as traditionally understood still exist? Traditional Jews, like Catholics, know the answer to the question. In the end, this is what unites Jews and Christians. Because they believe in truth, traditional Jews cannot and will not find a friend in Jesus—but because they do believe in truth, they can find a friend in followers of Jesus such as Benedict. A friendship founded on our mutual resistance to relativism is one that can unite us despite our theological differences. That will have to do until our debate over Jesus is resolved by God himself. Meir Soloveichik is a doctoral candidate in the philosophy of religion at Princeton University and associate rabbi at Congregation Kehilath Jeshurun in New York. 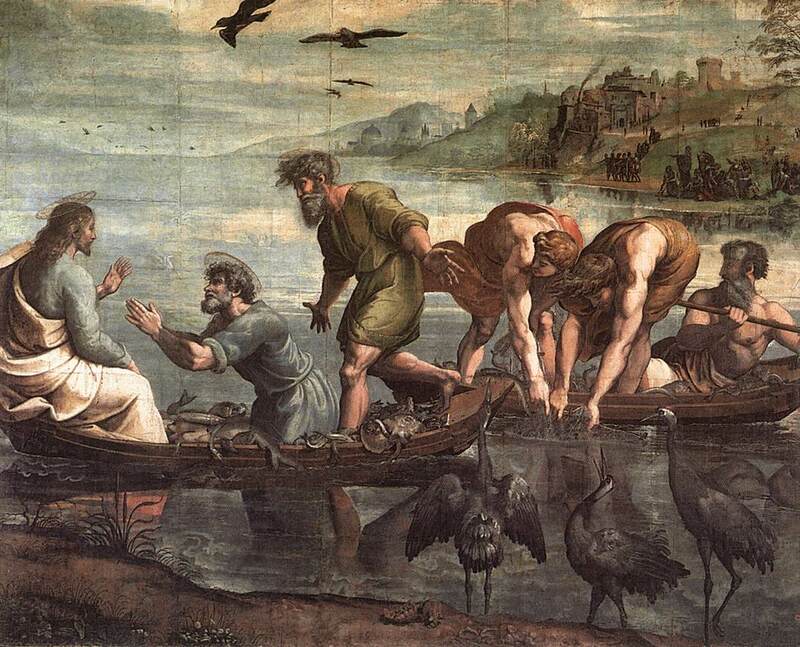 Painting by Raphael, Wikimedia Commons. Image cropped.